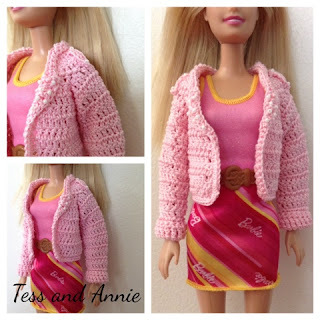 Here is the pattern for the Barbie Biker Jacket. Enjoy!!! Row 1: Ch 43, dc in 3rd ch from hook, 1 dc in each ch across, turn. Rows 2-6: Ch 3, 1 dc in each st across, turn. Row 7: Ch 3, (dc dec over next 2 sts) 2 times, 1 dc in each st across to last 4 sts, (dc dec over next 2 sts) 2 times, turn. Rows 8-9: Ch 3, (dc dec over next 2 sts) once, 1 dc in each st across to last 2 sts, (dc dec over last 2 sts, turn. Row 10: Ch 3, 1 dc in each of next 3 sts, ch 10, skip 5 sts and dc in next st, 1 dc in each of next 13 sts. Ch 10, skip 5 sts, dc in next st, 1 dc in each of next 4 sts, turn. Row 11: Ch 3, dc dec over 1st 2 sts, 1 dc in each of next 11 sts, (dc dec) 2 times, 1 dc in each of next 8 sts, (dc dec) 2 times, 1 dc in each of next 11 sts, dc dec over last 2 sts, turn. Row 12: Ch 3, (dc dec, dc, dc, dc) across, turn. Fasten off. Rnd 1: Join at bottom of armhole. Ch 3, 19 dc around, join, turn. Rnds 2-8: Ch 3, 1 dc in each st around, join, turn. Rnd 9: Ch 3, dc dec, 1 dc in each of next 7 sts, dc dec, 1 dc in each of next 8 sts, join, turn. Rnd 10: Repeat rnd 2. Rnd 11: Ch 3, dc dec, 1 dc in each of the next 6 sts, dc dec, 1 dc in each of the next 7 sts, join, turn. Rnds 12-15: Repeat rnd 2. Rnd 16: Ch 4, in BACK LOOPS ONLY, 1 tr in each st around, join, turn. Rnd 17: Ch 1, 1 sc in each st around, join. Fasten off and fold down cuff. Rnd 1: Starting at lower left corner of jacket, ch 1, sc evenly up to collar. (Dc dec, dc) across until you reach the rough edge of the jacket. Sc evenly down side of jacket and sc evenly across bottom part. Join to 1st st.
Rnd 2: Ch 1, sc up to part of jacket that curves in, IN FRONT LOOPS ONLY, hdc in next st, 1 dc in each of next 2 sts, 1 tr in each of next 2 sts, 1 dtr in each of the next 2 sts, hdc in next st, 1 sc in each of next 4 sts, 1 hdc in next st, 1 dc in next st, 1 tr in next st, 1 dtr in each of the next 13 sts, 1 tr in next st, 1 dc in next st, 1 hdc in next st, 1 sc in each of the next 4 sts, 1 hdc in next st, 1 dtr in each of the next 2 sts, 1 tr in each of the next 2 sts, 1 dc in each of the next 2 sts, 1 hdc in next st, 1 sc in each st around, join. Fasten off. Ch 6, 1 sc in 2nd ch from hook, 1 sc in each st across, fasten off. Sew onto shoulder. Love the jacket! And great for the upcoming fall and biker season. Pinned.